I live in Prince Georges County, Maryland, which has a population of 871,233 and covers 498.45 square miles. There were five designated early voting locations in this county. Whomever the Braniac was that figured five early-voting locations were enough for this county should be made to stand in line for, say, the next two years as punishment. For comparison purposes, the District of Columbia has a population of 617,996 and covers 68.3 square miles. They had eight early-voting locations; that’s with a 30% smaller population and only 14% of the size of Prince Georges County. 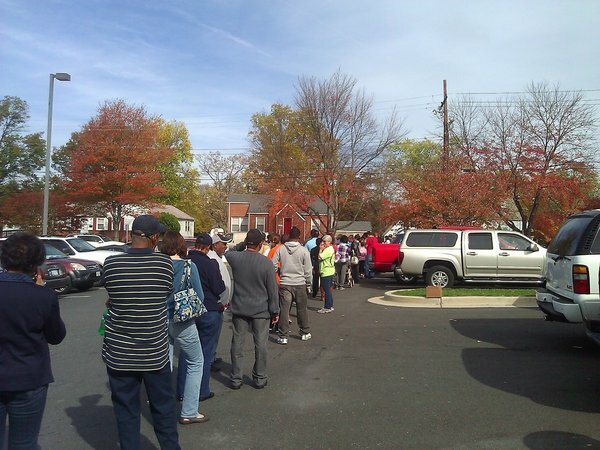 They had 70% more early-voting sites than PG County. I tried early voting Saturday at 2pm. The closest early-voting location to me is the College Park Community Center, and I couldn’t get near the place. Police officers were there to attempt to handle the traffic nightmare, but I was stuck on a residential street for thirty minutes in absolute gridlock. When a policeman walked by my car, I asked what in the world was going on; I though that perhaps there had been some sort of accident or catastrophe. He replied that all the cars were folks trying to get to the polling place, and that we all had to try to turn around and go home; officials hadn’t realized how many people would show up. When I tried again yesterday afternoon, accompanied by an impatient friend, we stood in line for 45 minutes, and gave it up when we were told that we would have to spend at least another 45 minutes before we’d reach our turns. I was all for staying, but my friend Bob was livid and refused to spend another minute in line. I really couldn’t blame him. So to Hell with early voting. Maybe one day some official can make an intelligent decision and designate a reasonable number of early-voting sites. I seriously doubt it.